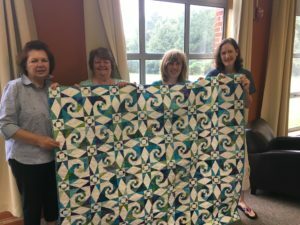 The Friends of Queen Anne’s County Library is happy to announce that Linda Agne of Stevensville is the winner of a hand-crafted quilt raffled off by the Friends. Pieced and quilted by a local Queen Anne’s County quilt group, the 57 inch x 66 inch quilt includes a blend of blue, green, and white fabrics in an intricate design. The Queen Bees of the Annapolis Quilt Guild donated this unique item to the Friends in support of the Friends’ efforts to enhance library programming for residents throughout the county. The Queen Bees are comprised of Lis Cockey, Eileen DeGraft, Terri Flaherty, Pat Holland, Lois Kurnocik, Marie Murphy, and Jamie Trainor. Sales of the raffle tickets generated more than $1350 in proceeds, which will be used to support the Library’s new Maker Space program, through which county residents will be able to work with Library staff to use such state-of-the-art tools and technology as a 3-D printer. The Board of the Friends of the Library congratulates Linda Agne on her beautiful new quilt and extend deep appreciation to the Queen Bees for their generous donation.